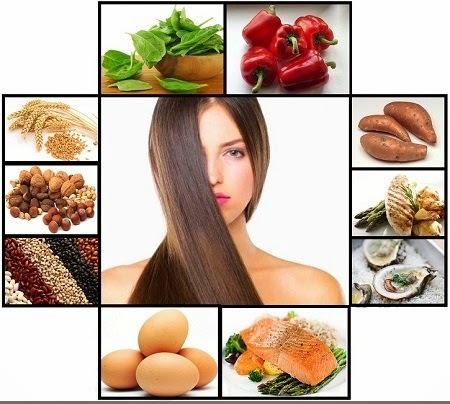 To have gorgeous and healthy hair, what we eat is as important as what we apply on it. Just like any other part of the body, the cells which make up the hair starts to look great with our next healthy and balanced meal. The nutrients which we eat help to fortify the hair follicle from which each strand grows and the scalp that surrounds it. So healthier follicle and healthier scalp means healthier hair. Other factors affecting hair growth are – smoking, hormonal imbalances and not enough sleep. Our muscles and mane must be feed at the same time. Hit the gym regularly and eat healthy food, then you will have a muscularly structure and thick, great-looking hair. Our body has a priority system, so if we don’t have enough nutrients in our diet, our body sends those nutrients to the cells essential for life. So the hair cells have a chance to be left out. 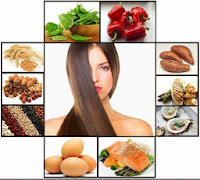 some of the important nutrients that are needed for a healthy hair are – Protein, Iron, Zinc, Omega-3 fatty acids, Lignans, Water, Vitamin C and Biotin. This cold-water fish is a rich source of proteins, vitamin D and omega-3 fatty acids. All these three nutrients are required for proper hair growth. The omega-3 keeps keeping the hair and scalp hydrated. This nut has a significant amount of omega-3 fatty acids. The rich content of biotin and vitamin E, helps to protect our cells from DNA damage. The copper in the nut helps to keep our hair color rich and lustrous. The zinc present in the oysters helps to prevent hair loss and dry, flaky scalp. It also boasts a good level of protein. Always remember that hair is about 97% proteins, without which it becomes dry, brittle, or weak. Every other cell of our body requires vitamin A for its normal functioning. Sweet potato is a very good source of antioxidant Beta carotene, which turns into vitamin A in our body. Vitamin A deficiency can cause itchy, irksome dandruff on our scalp. the four key minerals present an egg are – zinc, selenium, sulfur, and iron. Iron is required in correct quantities especially to carry oxygen to the hair follicles. Too little iron is sure to cause hair loss, especially in women. It is a good source of iron, beta carotene, folate and vitamin C which helps us to have healthy hair follicles and oil circulating scalp. Though tiny, legumes are rich sources of protein, iron, zinc, and biotin. It is a great food for vegetarians and non-vegetarians. This specific yogurt has a hair-friendly protein, vitamin B5 (Pantothenic acid) and vitamin D (closely linked with hair follicle health). This fruit has a high content of vitamin C which is critical for circulation to the scalp and supports the tiny blood vessels that feed the follicles. When the levels of vitamin C are low in our diet, it leads to hair breakage. It is a good source of zinc, iron and vitamin B which are required to keep the hair strands strong and plentiful.